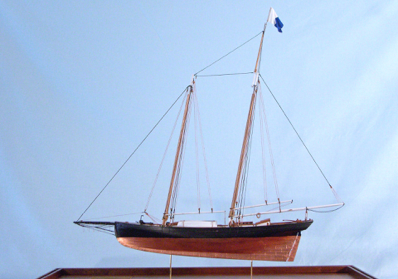 My Model of Mary Taylor is a scratch-built solid-hull model constructed from lifts, planked above the waterline and coppered below. At a scale of 3/16” = 1’, it measures approximately 18-1/2” long and about 18” high measured from the base of her keel to the top of her flagstaff. 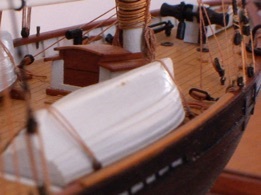 The model features a carved basswood hull and a deck planked in degamé, also known as lemonwood. Deck furniture and the rails are made from cherry. Hull planking is cherry and the masts and spars are birch. All blocks, deadeyes, and bullseyes are scratch built from boxwood. Some metal parts, such as those for the windlass are made from brass sheet, tubing or rod. Others, such as windlass heads, pawls and anchors were cast from britannia pewter using carved wooden parts for mold patterns. The pilot yawls stored on deck are carved from basswood lifts using plans published in the Nautical Research Journal. The upper part of the boats are planked in lapstrake fashion. 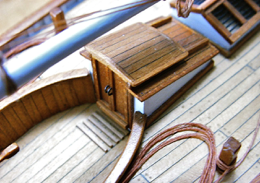 The model represents the classic American pilot boat from the mid-19th century. As the pilot service was competitive in New York at this time, these boats were built for speed. The faster they could sail, the more likely they could beat out their competitors to the ships sailing into the harbor and in need of their services. 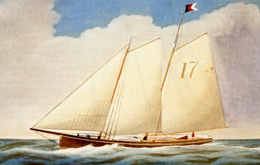 Mary Taylor was designed by George Steers, who was so successful in his pilot boat designs that he went on to build the yacht America, which was also built on the pilot boat style. As many people know, this is the yacht that sailed at Cowes against the British royal yacht squadrons to beat them all for the 100 Guineas Cup, later to become the America’s Cup. 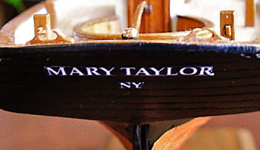 Mary Taylor was one of the fastest pilot boats in New York harbor in her time. Built for speed, she was the direct forerunner of the worlds most famous racing yacht, the America.